In honor of the fact that I am almost done marathoning through the Welcome to Night Vale podcasts (I consume a lot of media, and I am usually behind on something), and in more honor of the fact that tomorrow night I get to sit in a fancy theater and enjoy a fancy liveshow crossover with Welcome to Night Vale and The Thrilling Adventure Hour, today's SFC Friday is all about Intern Dana! And, really, all of the Night Vale Community Radio interns. Because they are rad. I've talked pretty extensively about Welcome to Night Vale before, so I'm not going to recap it again. Suffice to say, it's a fake radio program about the world's weirdest small town. The main character and main voice is the host of Night Vale Community Radio, Cecil Palmer (Cecil Baldwin voicing), and he has a variety of interns and friends who make their way onto the airwaves with pretty solid regularity. Most important of these, though, is Intern Dana, who started off as yet another of the disposable interns, albeit harder to kill than most, but managed to stick around, due to her tenacity and also probably the fact that her name is fun to say. Intern Dana. Intern Dana. Daaaaaanaaaaa. The reason Intern Dana gets her own article is partly because she is actually the most prominent secondary character on the show, next to Carlos, of course, but more because of the way she is characterized. Intern Dana isn't a supporting character in the traditional sense, nor is she in any way meek or subservient, or even forgettable. Intern Dana, and it is honestly hard to write her name without Intern in front of it, has her own story, her own struggles, and while that story is tangentially related to the overall plot of the show, it's really more about Dana herself, wandering through the wasteland, refusing to give up. It's that refusal to lay down and stop trying that makes me love her, and it's why she merits her own article on here. You see, a while back on the show - gosh, Episode 20, "Poetry Week" - Dana (or her double, one of them was killed during the Sandstorm but even Dana isn't sure which) enters the Dog Park to investigate a mysterious pyramid. The doors of the Dog Park then close behind her, trapping Dana inside with the Mysterious Hooded Figures and also the Man in the Tan Jacket. Of course, the Man in the Tan Jacket isn't really bound by any laws of nature or even of supernature, and so he gets out, but Dana is stuck, for months, in the Dog Park. Dana doesn't give up or break down. Instead, she sends regular text message updates to Cecil, and carries on with her job of investigating the Dog Park and the Mysterious Hooded Figures. One day a door appears - a door that doesn't seem to lead anywhere - and Dana walks through it. She ends up in a twilight realm, where no one can see her, and the only person she can see is John Peters, you know, the farmer. Then Carlos and his scientist friends do see Dana, but they see her exiting the House that Doesn't Exist. After that, Dana is gone. Well, sort of. She's still around, and still texting with Cecil. Sometimes she sends him voicemails, and he plays them on the radio. Dana (voiced by Jasika Nicole) finds herself wandering through the desert, trapped in a side-reality that is completely devoid of, well, everything. And does she give up? Nope. In fact, from what we know from the show, Dana continues wandering in that desert, climbing a mountain, finding a suspicious settlement, all that stuff, for months. Almost a year now, actually. And she even mentions several times that she is sometimes tempted to just give up, sink down to the ground and join the grey nothingness of the matter that surrounds her. Only she doesn't. She doesn't stop trying to find a way home because she desperately wants to see her mother and her brother again, because she wants to live and breathe and enjoy her life, and because she wants to know what this place is and why she was brought there. 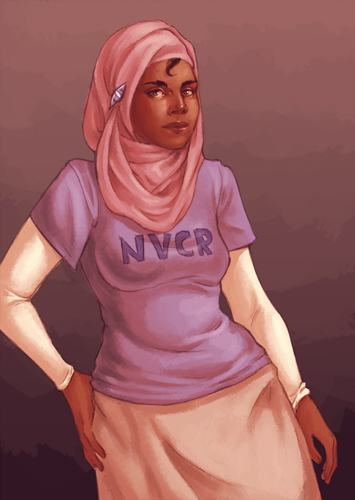 Dana's awesome, and cool, and seriously just a really fun character, but she's even more impressive when stacked up against the other Night Vale Community Radio interns. You see, aside from Dana, nearly every single other intern has died or disappeared or turned into a tree on their first mentioned errand for the radio station. The Night Vale Community Radio internship program has a freaking awful attrition rate, and it's not because people aren't committed to the program or because they keep quitting, it's all deaths and disappearances. In all of this, though, stands Intern Dana, who has somehow managed to not only survive months and months of utter solitude and potential death, but actually to stay herself. She didn't just stay sane, she also stayed sweet. It takes a lot of force of character to do that. 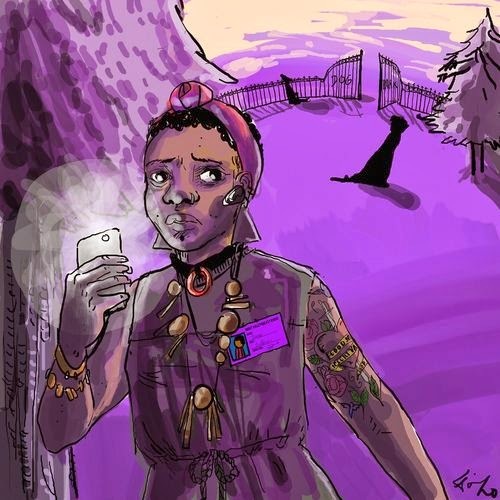 One more thing - this isn't going to be a super long article - but can we appreciate for a second the level of diversity represented in Night Vale? While we don't get a visual representation of Dana ever, because this is a radio program, we do know that the writers generally consider the voice actors to be a rough basis for any visual of the character, and so the casting of Jasika Nicole, an African-American actress, as the most important and central female character on the show, and the second most central figure full stop, is kind of a huge deal. Can you imagine a show like this, like, say, Supernatural, where the main character was a nice white guy, sure, but his main sidekick was a tenacious and incredibly sweet African-American woman, and then his boyfriend was a Hispanic scientist, and the town around him was filled with diverse, interesting, well-characterized people? Well, it wouldn't look anything like the Supernatural we've got right now, at any rate. 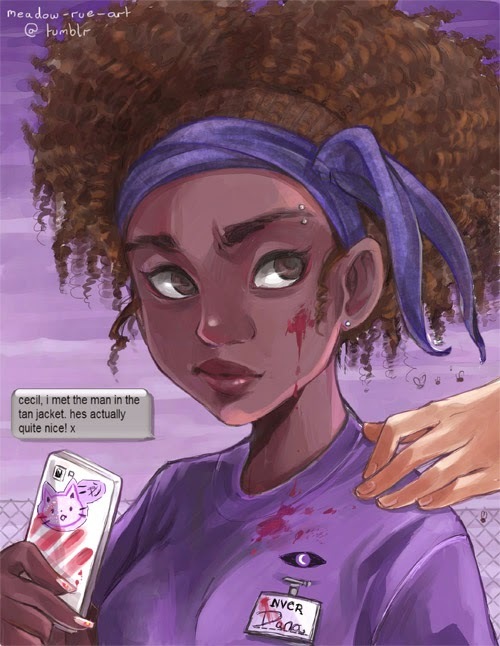 But more than that, shows like Welcome to Night Vale, which prioritize the representation of minorities as people with lives and stories and engaging perspectives on the world, are so incredibly important to the shifting face of the media landscape. We need more shows like this. On nearly any other show, Intern Dana might be a recurring character, but she probably wouldn't have her own storyline, and she certainly wouldn't be so independent, so thoroughly characterized. She wouldn't be Dana. 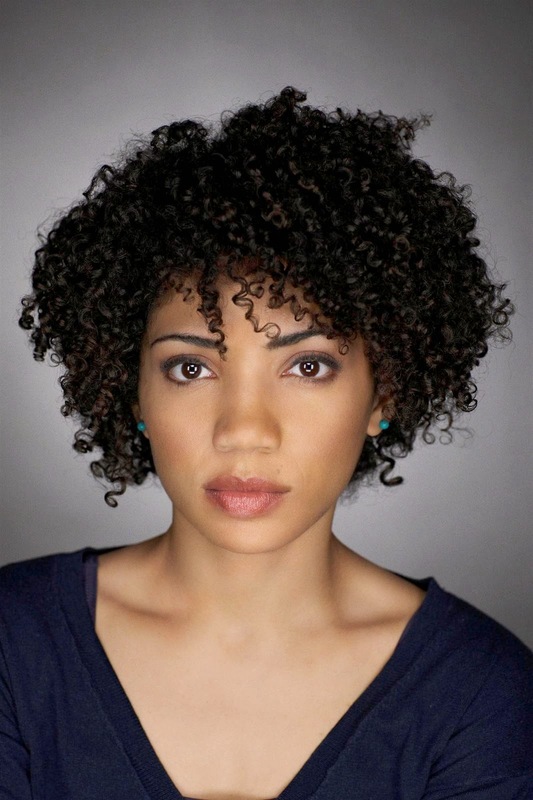 Jasika Nicole, an African-American actress, as the most important and central female character on the show, and the second most central figure full stop, is kind of a huge deal. She was always underused on Fringe (though it got somewhat better with time). Her role on Fringe always made me a little uncomfortable, actually. Like, she's a great actress, and Astrid was a cool character, but the way she was treated - the only prominent WOC on the show is the crazy guy's babysitter and the gofur for the whole team - it didn't sit right. Still, Jasika Nicole is awesome.